Published by Cyril Huze April 16th, 2016	in Customs, Editorial and Engines. Think of the all-new Street Sleeper® III Air Cleaner from Crusher® as a heavy-breathing wolf in sheep’s clothing. 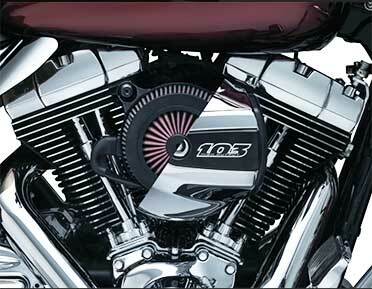 The high-flow intake kits deliver significantly enhanced airflow to all ’99-’16 Harley-Davidson® Twin Cam motors, while lurking discreetly under the factory air cleaner cover for a deceiving stock appearance. Street Sleeper III Air Cleaner kits include a Crusher-designed lifetime-warrantied K&N® filter element that’s washable and reusable. Full perimeter and outer-end breathing provides unrestricted airflow for greatly improved performance versus the stock filter element. A unique internal crankcase breather design eliminates the need for external hoses or fittings for a clean appearance. The cast aluminum back plate features a large, curved entry to the throttle body for smooth and precise air delivery to the motor. Street Sleeper III Air Cleaner kits are compatible with Crusher Maverick Air Cleaner Trims (coming soon), Kuryakyn Quantum Air Cleaner Covers (P/N 8414 – Gloss Black, P/N 8417 – Chrome), and all ’99-’16 stock H-D round and oval center-bolt air cleaner covers. 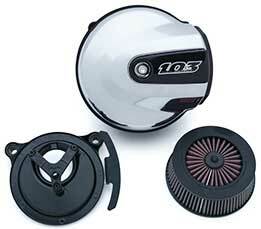 • P/N 9606 – Crusher Street Sleeper III Air Cleaner, MSRP: $159.99. Fits: ’08-’16 Electra Glides, Road Glides, Road Kings, Street Glides; Trikes, ’16 Softail, ’11-’12 FLSTSE, ’13-’14 FXSBSE, ’14-’15 FLSTNSE. It’s a shame that you buy a Harley and then have to spend so much getting it to run right!! With the EPA it is only going to get worse. You can thank them for the eventual demise of the air cooled motorcycle engine. If you like your air cooled V-Twin, better hang onto it. Thank you, Denny barto !!! for as long as I can remember !!! !